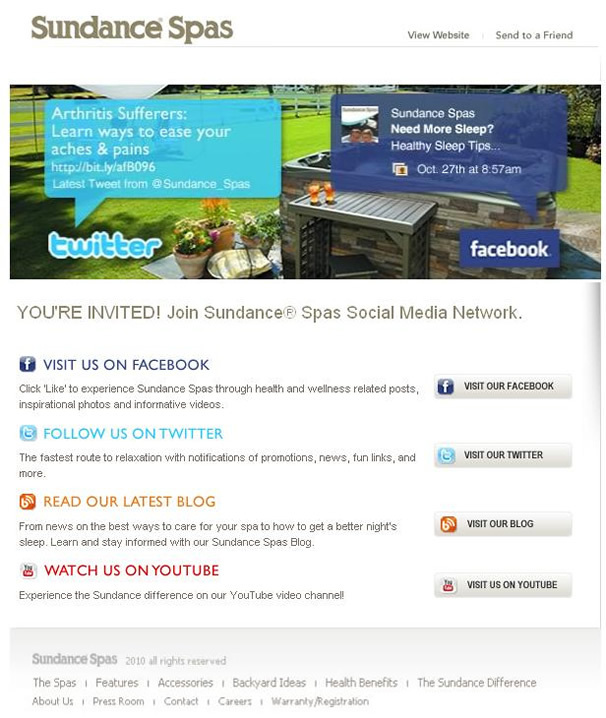 Last Thursday, October 28th we helped send an email blast out to Sundance Spas‘ customers and potential customers, encouraging them to join Sundance’s social media network. As you can see from the design, we were focused on driving traffic to Sundance’s Facebook, Twitter, and YouTube profiles, in addition to their blog. As of this post, the number of ‘Likes’ for Sundance on Facebook had increased over 300%. Facebook wasn’t the only site to see positive numbers as hundreds more clicked through to check out their other social media profiles as well as Sundance’s main website. As we’ve discussed in the past, social media has become an essential part of creating a two way conversation with customers, which, if done properly, can be an amazing tool for building brand awareness and making connections.